Tips from the T-List book available to download here! 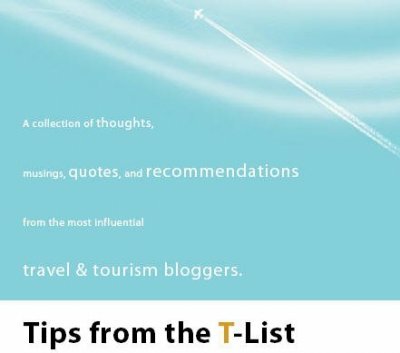 "Tips from the T-List brings together the collective intelligence of dozens of influential travel industry bloggers from around the World." Les Explorers is included inside "Tips from the T-List, the World's First Book of the Best Travel Marketing Blogs." >>71Miles : The definitive guide to weekend trips around major cities. Interview de John A. Vlahides - Executive Editor and Co-founder. Welcome to Community of Sweden: a Sweet Sweden Community !!! 'How was your stay?' : Does the Hotel Ritz has something to learn about Travel 2.0 ? © 2019 Lesexplorers.com. All Rights Reserved.